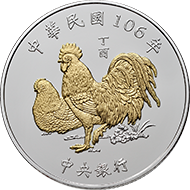 The Chinese Zodiac Commemorative Coin Set features the Chinese zodiac in a given year. The first set went on sale in 1993. Two complete series have already been issued. The first series were sold between 1993 and 2004, characterized by themed medals bearing the images of the Chinese zodiacs and coins of various denominations. 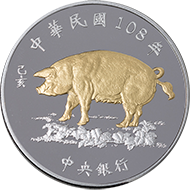 The second series were sold between 2005 and 2016, notable for commemorative silver coins bearing the images of the Chinese zodiacs and NT$50 and NT$20 coins. The third series has gone on sale in 2017 and will introduce commemorative silver coins and commemorative copper-alloy coins, both bearing the images of the Chinese zodiacs. 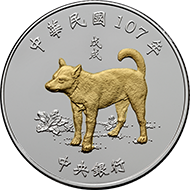 Copyright © 2013 Central Bank of the Republic of China (Taiwan). All Rights Reserved.